Ruby Karn brings her experience as a teacher and entrepreneur to Berkshire Hathaway HomeServices Blake, Realtors. 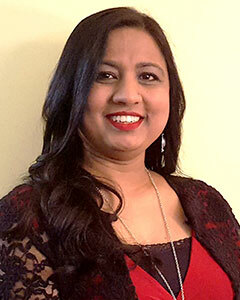 After earning a Master's degree in Population studies/Demography from Nepal, Ruby taught in undergrad college for several years before moving to the US. Since then she has been primarily working in the field of Social Services. Ruby also has banking and sales experiences that complement her professional background. Her entrepreneurial mindset and passion for real estate led her to become a Real Estate Investor. After six years of successfully owning and managing investment properties, Ruby decided to leverage these talents to help others in the purchase and sale of their home or investment properties. Ruby understands that buying or selling real estate can be stressful and confusing. Her knowledge and experience as an investor gives her a deep understanding of the problems that often arise and how to handle them, thereby making the real estate transaction as smooth as possible. Ruby has been living in the Capital Region area for the last 14 years with her husband and three kids. It’s her family that inspires and motivates her every day. In her free time, Ruby likes to spend time with her family, volunteer in the community, travel to new places, watch comedy movies, read books, take walks and get together with friends. Ruby has fluency in multiple languages, English, Hindi, Nepali and Urdu. Using those skills she will be able to help a wide range of clients. Her patience, professionalism and dedication will make your real estate transaction - whether buying or selling - a very successful and enjoyable one. Please call Ruby for your real estate needs.